My favorite bookmarking tool has become the 3M Post-It Arrow Flag, rather than the traditional bookmark. Nowadays, I only use a traditional bookmark for the book I keep by my bedside, which always stays there and never gets rough duty. For all other uses, the Arrow Flag can’t be beat, as it stays in place and can be used to mark the exact sentence or paragraph where you left off. And it is more versatile. For example, it can be used on a stapled printout, whereas a regular bookmark would be useless in such a situation. The Arrow Flags don’t last forever, as they eventually lose their stickiness — but they do last a good long while, and you get 96 of them in a package. If you’re looking for a little more style, you might try the copper Page Dart. 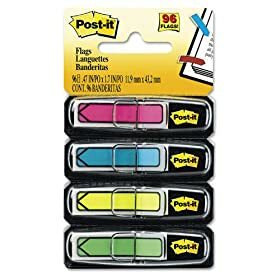 At about $5.00 for 12 of them, they’re more expensive than the sticky-arrows, but they’re quite elegant and stay in place on the page as well.